How do Montessori classrooms for 3-6 year olds approach this goal? Children are naturally curious about the world surrounding them. In Montessori we offer a rich, engaging environment for children to explore. Because we want our children to connect with the real world our classroom is very ‘home like’ with child size furniture and materials. Children’s work is always carefully designed and prepared so it is aesthetically satisfying and meaningful to young minds. All the work on each shelf is placed at a low height so young children can access work easily and safely. Children can decide what work they are going to do depending on their developmental stages, and practice their work at their own pace. Practical life shelves are a favorite for this age group because children can independently learn everyday life skills by using real materials. For example, children do not play with toy food in a toy kitchen. Instead, they use actual fruits or vegetables, a child-size wooden cutting board and a knife, and plates and utensils to prepare a snack to share with peers. Children show great focus on these tasks because they know they are working with real materials. Children also gain confidence and independence through these exercises. They also learn body movement and hand eye coordination; they walk carefully to approach peers while holding the china tray with sliced apples. If the plate is dropped, it will break, so they learn to walk slowly and carefully. When children spill water they use a real mop to clean. They love to dust the shelves and sweep the floor just like their family members or caregiver at home. They love to do real work and feel very proud being able to care for their environment. Through these activities children gain great confidence and independence, and develop a sense of responsibility as a community member. We are so grateful to work with these young children to support them so they can be successful! Happy New Year to all families! An aspect of the Vermont Early Learning Standards (VELS) I will touch on this month is developing problem-solving skills. We want children to display interest in new situations, demonstrate flexibility, creativity, and innovation when solving challenging tasks. One of the most important ways that the Montessori approach supports problem solving for children is how the classroom adult approaches a child in a ‘challenging situation.’ We never do for the child what they can do for his or herself. We are constantly gauging how much challenge is appropriate for each child and do not rush in to ‘save’ a child from reasonable struggle. By not jumping in to rescue a child from a challenging task, we provide opportunity for the child to come up with solutions, such as asking an adult or a friend for help, or the burst of pride and joy when the child zips his own coat by himself for the first time. The young child shows us that they want this opportunity to try. Have you ever had a two or three-year-old child swat your hand away as you habitually reach down to do something for them that they can and want to do for themselves? Necessary to developing problem-solving skills is the confidence to try and fail and try again. Children need to feel the sweet reward of their efforts paying off. This encourages them to try other, more challenging tasks in the future. Many of the Montessori materials in the Primary classroom provide gentle feedback as a child explores with it. This is called ‘control of error’ and describes an inherent physical aspect of the material that indicates to a child when they have made an error. Control of error in the material allows a child to notice their own mistake and fix it; an adult never needs to step in and offer correction. A simple example is the control of error in the set of ten pink cubes of the pink tower. A young child exploring with this material may not yet visually perceive all the differences in cube sizes. When building the tower, they will see that it does not look the same as when they took it from the shelf. If their stacking is really off, the tower will even fall over! The control of error built into the material calls to the child to try it again, to experiment with what didn’t work the first time and, eventually, to master the concept being taught by the material. Another interesting characteristic of the Montessori classroom to consider when discussing problem-solving skills is the mixed-age grouping of children. When a three-year old confronts a challenge, they have not only the example modeled by the adults in the classroom, but also the solutions modeled by the four, five, and six year old children in the classroom. This provides the child with multiple possible solutions to test but also demonstrates for them that there is more than one way to solve a problem, thus fostering a sense of flexibility and creativity. The same can be said for exploring the classroom material. While the guide presents some guidelines for exploration (ie how to respectfully and safely use the material), we invite the child to explore in an open-ended use of each material. In addition to the adult’s presentation of the material, a child has probably also observed many other children exploring with the material, so they already have many creative options for exploration that also set the stage for innovation and discovery. A recent example I observed in the classroom occurred with the metal insets, a material made of metal stencils of geometric shapes that the children use to draw beautiful and creative patterns while practicing and refining their use of a pencil. Recently, a child discovered that by layering the circle over the quatrefoil, a crescent moon shape could be made. She then colored the moon and cut it out. This discovery came together from her extensive practice with this material, her familiarity with the relationship between these geometric shapes, as well as other skills such as careful use of scissors, and a sense of liberty to explore and innovate with the basic lesson of using the metal insets. After this child created this crescent moon, many other children began attempting the process, demonstrating their own curiosity for this new way to use the material. 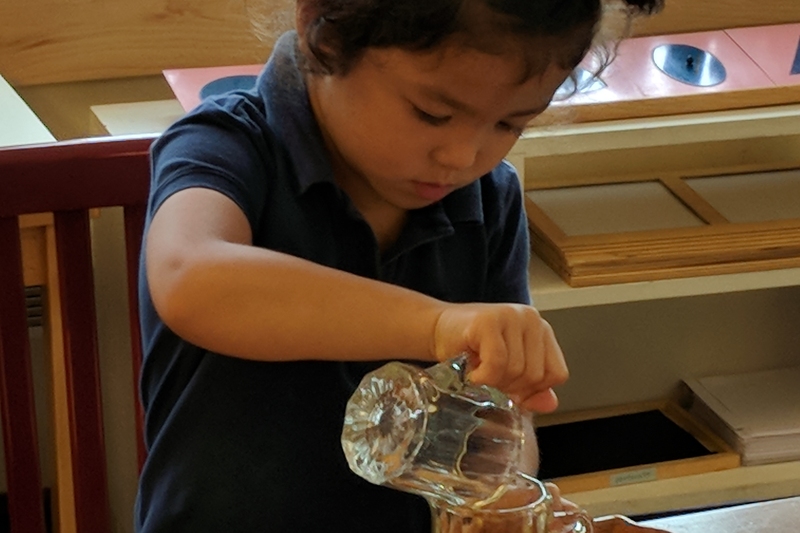 Many aspects of the Montessori learning environment, including the approach of the trained Montessori adult, inherent qualities of the Montessori material provided control of error while encouraging open-ended exploration and discovery, and the mixed-aged classroom can stimulate and support problem solving skills. As a Montessori adult, it amazes me to watch the children discover novel ways to solve a problem!